Loving Johannesburg is our business and we pride ourselves on knowing what’s good for business. Our backpackers accommodate at 2B Happy because we are in the prime location for those looking to explore and we also know how to enjoy the Johannesburg experience. We have compiled a bucket list of things to do and places to go in Johannesburg, our list includes everything backpackers should try out and tick off during your stay with us. Pilanesberg National Park - Just 2.5-hours north west of Johannesburg is the most beautiful wildlife park. Pilanesberg Park is located on a 1300 mil year old volcanic erupted area which is the reason that it has the largest vaiery of wildlife species in one park compared to anywhere in Africa. Shepstone Garden – Just across the road from us is the Shepstone Garden. Shepstone is a unique heritage site in Johannesburg; the main house was built from the local quartz nearly 350 million years ago by Afrikaans prisoners captured during the Anglo Boer War. It was one of the Witwatersrand Ridge houses commissioned by the Modderfontein Dynamite Company after the Anglo Boer War. Informally the Shepstone gardens, also known as the Secret Garden, serves as a reminder of Johannesburg’s historical past including the stone craftsmen and gardeners that dedicated their skills to the construction of this astounding landmark. Soweto – Soweto stands for South Western Township, follow the footsteps of Nelson Mandela and Desmond Tutu in their hometown. While visiting Johannesburg Soweto is a must see for those that want to learn more about South Africa’s intriguing culture and history. Soweto was developed as a township for black people under Apartheid and was where the struggle against Apartheid was fought. The Apartheid Museum – Experience an emotional-filled journey to the Apartheid Museum, the museum is an impressive complex in Johannesburg that’s dedicated to illustrating the history of the Apartheid in South Africa over the 20th century. The museum opened in 2001 and is acknowledged as the pre-eminent museum in the world dealing with the 20th century South Africa. Neighbourgoods Market – Enjoy local Cuisines and live music at the neighbourgoods market every Saturday, the market is the source of fresh food and specialty goods and acts as a meeting point to enjoy everything the local community has to offer. The aim of the neighbourgoods market is to inspire people with the energy that makes up Johannesburg. Radium Beerhall – Why not stop over at the Radium Beerhall for a beer or two? Radium Beerhall is the oldest surviving bar and grill in Johannesburg. An authentic bar and grill with a genuinely historic atmosphere and a live jazz band dedicated to making the visit one worth remembering. World Heritage Site – Be sure to visit the impressive World of Heritage site of the Cradle of Humankind. The site was declared a World of heritage site by the UNESCO and contains an astounding complex of limestone caves. Containing the discoveries of hundreds of million year old fossils, the site is visited by thousands of paleoanthropological enthusiasts every day. Bassline Newtown – Head down to Bassline in Newtown to listen to the very best in jazz and popular blues music. Bassline was founded in 1994 as a small live music venue but has since then grown into the ultimate live venue to experience South Africa’s finest Jazz and Afro-beat music, poetry, comedy and impromptu jam sessions. Artists such as Zim Ngqawana, Vusi Mahlasela, Jimmy Dudlu and much more have all performed on a Bassline stage. Bungee Jumping – For adrenaline junkies! Why not get your adrenaline pumping by jumping off one of the amazing, colorful and cooling towers in Soweto? This is one of the most exciting ways to enjoy Soweto’s amazing views from the top of the towers; you could enjoy a heart-pumping adventure in an unadulterated township setting. Red City Tour – One way to see Johannesburg in a single bus ride is taking the Red City Tour, sightseeing at its best; the bus will take you around the city on a hop-on basis while the running commentary introduces you to everything you might not know about the City of Gold. As well as getting acquainted with the city, the Red City Tour is also a good way to save money on transportation as the cost for a day’s ride is only R150 and could even work out cheaper if bought online. Lion Park – Voted the number one tourist attraction in Gauteng, the lion park is home to over 85 lions. Open every day of the week this park guarantees close encounters with some of Africa’s most revered species, including white lions, cheetahs, wild dogs and much more. The park provides a chance for locals and tourists to learn more about their wildlife. FNB Stadium – Visit the stadium that wowed the world during the World Cup in 2010, also referred to as the Soccer City, this grand stadium is bound to leave you speechless as you step into the 95 000 capacity stadium. The stadium now serves as the home ground to the Kaizer Chiefs F.C. ; you can catch one of their games and blow your Vuvuzela till your heart’s content. New Bruma Flea Market – Bruma Flea Market offers a wide range of arts and crafts from South Africa and other African countries, the old Flea market closed in 2012 but the new flea market is home to over 50 merchants along the Oppenheimer street in Bruma. Check out African souvenirs, sculptures, wood craft, African clothing and lots more. Johannesburg is a beautiful place whether you are hiking up one of the numerous beautiful mountains or visiting the Shepstone garden or even just in the everyday hustle and bustle of the city. These are just a few of the things that can be done in and around Johannesburg. The amount of things and places available to tourists are literally countless and cannot be covered in just one visit. The best part of it all is that we are a stone’s throw away from the heart of it all. So if you’re looking to explore Jo’burg properly and need accommodation with a fantastic location the look no further than 2B Happy. Give us a call on 02782 4476811 or email us at info@2bhappy.co.za for more information on staying with us. Easter Special in Karoo Private Ending 30 April 2019- stay for more than 1 night and pay R 300.00 per night for a single person and R 500.00 for a couple. Stay in Mkhukhu Ext 1,2 or End and pay R 4200.00 for a month. We can organize tours for you in Jozi, Soweto and all over South Africa at an affordable cost. 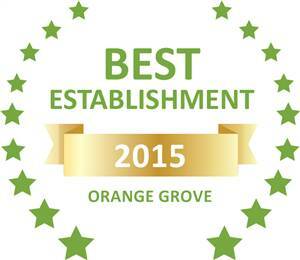 Based on reviews of establishments, 2B Happy Accommodation has been voted Best Establishment in Orange Grove for 2015.